As promised, in honor of National Family Caregivers Month and this year’s theme “Take Care to Give Care,” we are sharing some giveaways and tips to help you care for yourself this month. 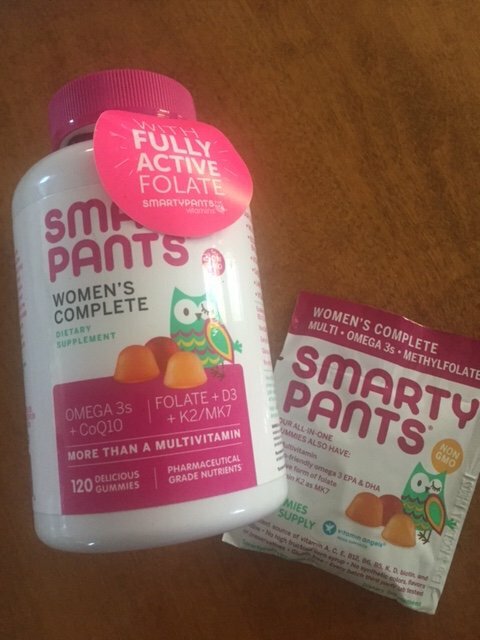 Today’s giveaway is a bottle of SmartyPants Vitamins Women’s Complete. Disclosure: This post is sponsored by SmartyPants Vitamins. All opinions are my own. As a caregiver, chances are pretty high that a well-meaning family member or friend has told you at least once,”You should take care of yourself.” Aren’t those the six most annoying words in the world? We know we should take care of ourselves. The challenge is how. Well, here’s a simple tip: take a multivitamin. We all have days when we grab whatever we can find for lunch, or we feed our feelings with something salty and crunchy, or we are so busy we forget to eat. (Well actually, I never do the latter, but you might.) By taking a multivitamin we know we are getting our daily dose of nutrients. SmartyPants Vitamins come in gummy form, so taking them feels like eating candy. But don’t let the sweet taste fool you. The Women’s Complete product is loaded with multivitamins, Omega 3DHA and EPA fish oil, Vitamin K, and folate. And, they are non-GMO, gluten-free, and allergen-free. And with a tag line like this: “A multitasker that does it all. Just like you,” how can you resist? Enter our giveaway by sharing a simple self-care tip. You can also order your own supply of SmartyPants here. i love smarty pants vitamins. and they actually taste good too!! my caregiver tip: walk w my dog. even if it’s only for 10 minutes. fresh air is good! Thanks Kim. I miss my dogs. Walking them was one of my top 5 things that made me happy.